Every adventure bikers dream is surely to ride somewhere that's never been ridden before, but in this overcrowded world a dream like this is hard to realise and is unquestionably going to mean some extreme adventure. Preferring small 400cc bikes and travels with minimal luggage (one 20 litre bag) light and fast. 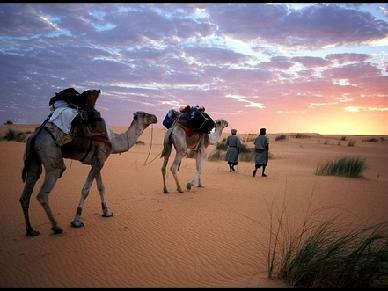 Pushing north from Timbuktu into the unridden empty western quarter of the Sahara the team will try to follow the only remaining ancient camel route still used over 1600km of sand dunes to the legendary town of Taoudenni. Rarely visited by westerners (and never by motorcycle from Timbuktu) the team will contend with tribal law and seas of sand as they battle their way north. As with any good trip the expedition target will see the trip only halfway complete as the return trip to Timbuktu will continue to test both riders and machines.